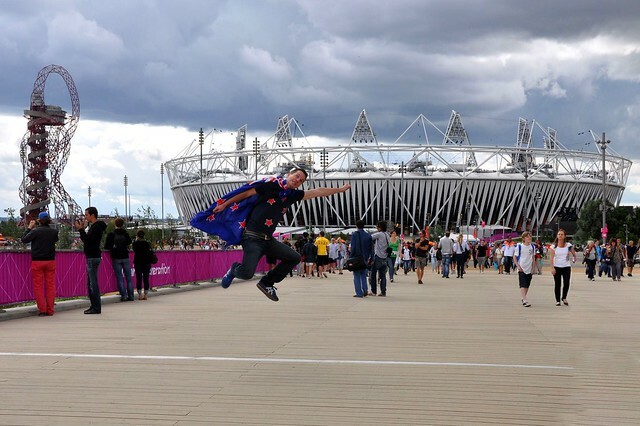 As most people know, there’s a big sporting competition going on – the London 2012 Olympics. 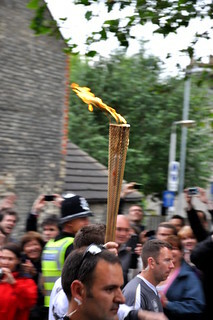 One of the pre-Olympic activities that we’d been seeing on the news for weeks was the Olympic Torch. We figured we should see it when it came to Cambridge. Particularly since it was planned to go past our street. 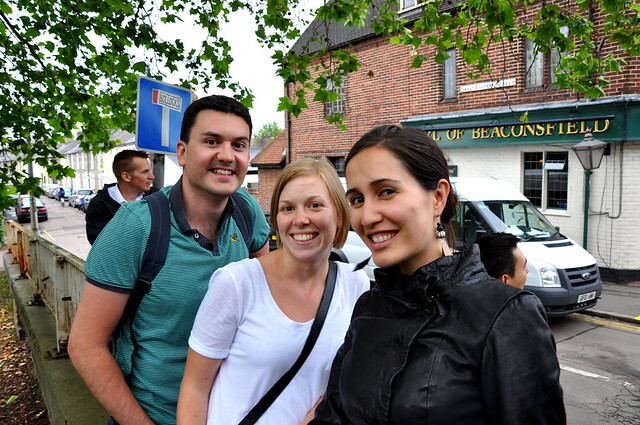 So we wandered the 100m down the road, met some of our friends, and watched the parade. 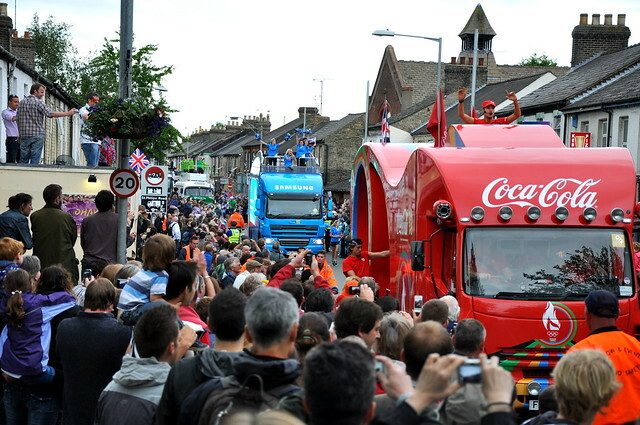 The streets were packed with locals, but unfortunately we were a captive audience for some messages from the London 2012 sponsors…. 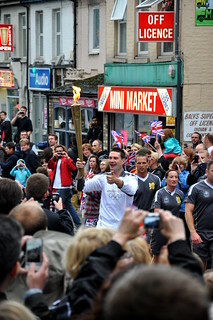 The torch did eventually come, being carried by Tony Burton, a local fireman who promotes Road Safety to young adults and works with the Young Carers group giving youths some time away from their homes. Good on you, Tony! Sounds like a really great guy. We went down to London for a weekend to check things out. 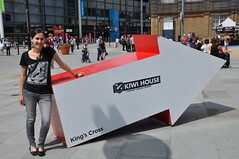 Everyone had been talking about Kiwi House in London as the place to be, so figured we should check it out. Basically, its a big big sports bar. 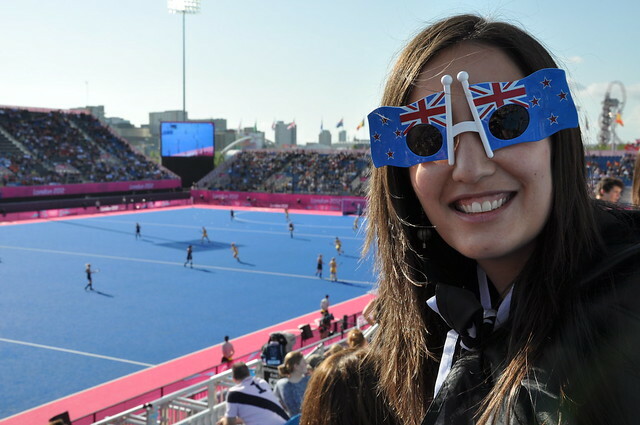 They sell NZ beer, NZ food cooked *by* NZers as well (Peter Gordon designed the menu) and they only showed sports that NZers were in on big screens. Brilliant stuff! Rob had a steak and cheese pie for lunch (hard to come by in the UK! ), and I had BBQ NZ lamb. Yummy! We bumped into a few people we knew while we were there. Not surprising really. 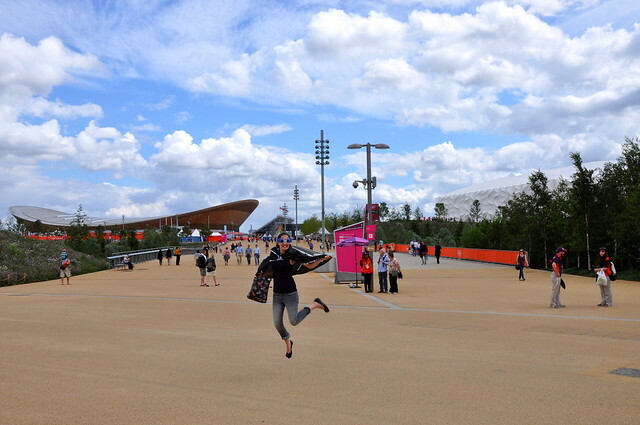 But onto the Olympic Park. The park is *massive*. It takes you 20 minutes to walk from one side to the other! But the security processing and everything was so well handled. Lots and lots of soldiers manning the bag scanners and metal detectors. I was pretty impressed with the organisation really. 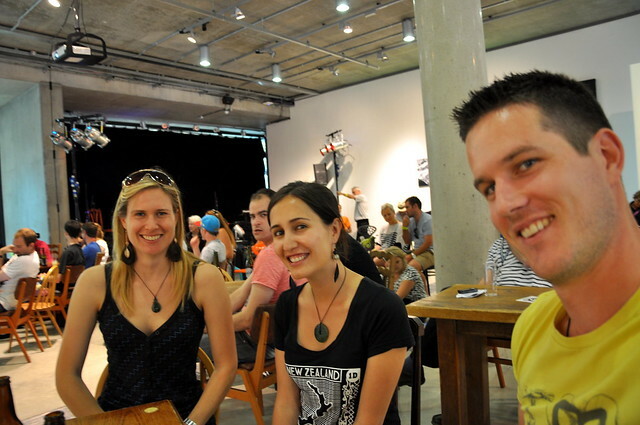 Regardless, this seemed the perfect venue to wear some of our Kiwiana tat that we had. Rob’s in front of the Olympic Stadium here, with the windy lookout to the left. That’s the velodrome in distance, which will be taken down after the Olympics. 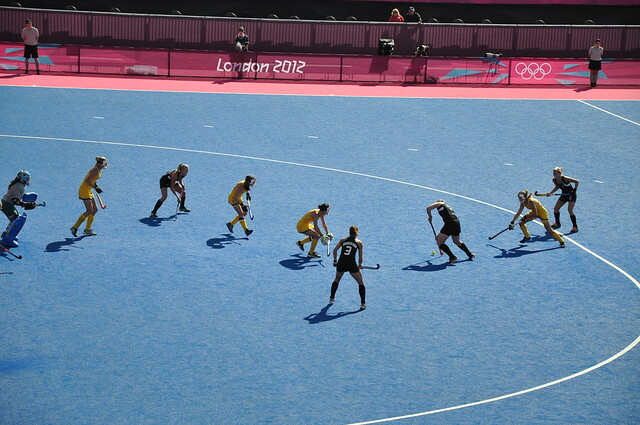 We managed to get tickets to NZ vs Oz Women’s Hockey. I was so excited! 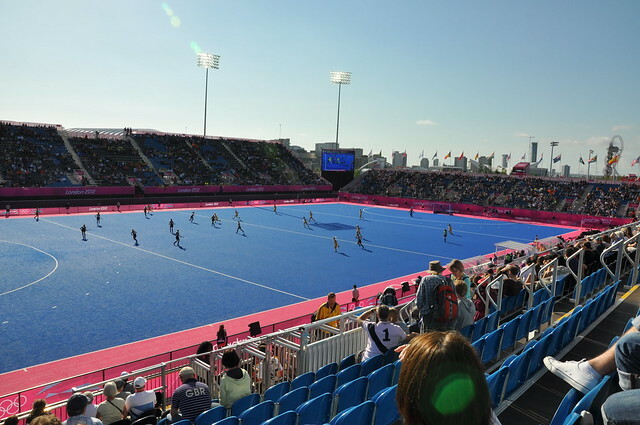 The hockey stadium is a temporary one setup at the Olympic Park. All scaffolding on the outside, and a real stadium on the inside! At 8.30am, it wasn’t completely packed, but apparently half the tickets were bought by Holland vs Belgium fans for the game after ours. It was an amazing sunny morning though! Our girls played an *amazing* game. Gotta love beating Australia every now and then! 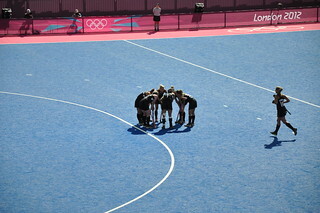 It was a brilliant game that day, and our girls played so well through-out the tournament. Even though we didn’t end up getting the Bronze medal (*cries*) I am so proud of our team. We haven’t done anything except watch the Olympics these past couple of weeks. 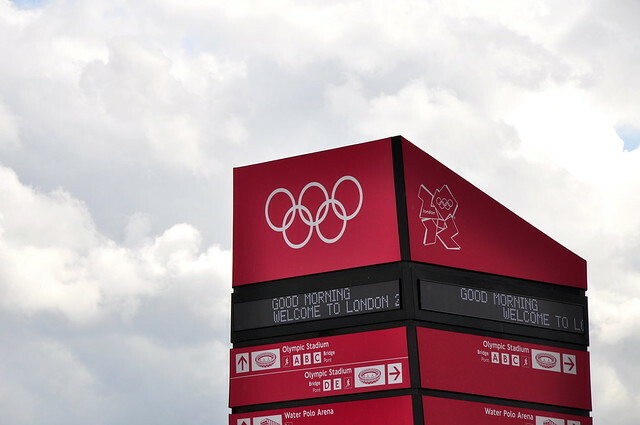 So nice to be in the same time zone as the Olympics for once! Who’s looking forward to Rugby 7’s in Brazil in 2016? I think we definitely are!